For the second time in three weeks, Steven May has set recorded careerhigh disposal tallies (this time with 27). The Gold Coast defender has also taken a career-high 14 marks and won an equal-personal best 14 intercepts. Back to back goals has given Greater Western Sydney something breathing space. The Giants have kicked their third goal launched from 11 centre clearances. 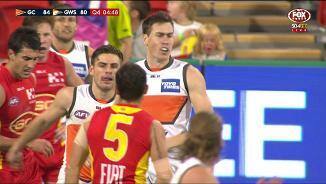 Jeremy Cameron has kicked his fourth goal putting the Giants back in front. Greater Western Sydney has only led for 11 minutes across the match, while Gold Coast has led for 76 minutes and scores have been level for 24 minutes. Gold Coast has been more dangerous from shots from general play, kicking seven goals straight from that shot type compared to just 5.5 by Greater Western Sydney. Stephen Coniglio has now recorded 31 disposals, four intercepts, five clearances, three tackles and six forward 50 entries. This is the 11th time from 18 games this season he has had 30 disposals or more. 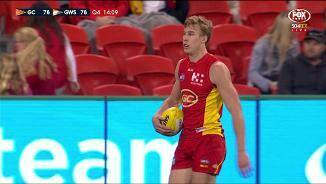 Following another counterattack from the back 50, Tom Lynch has kicked his fourth goal, taking his tally to 61 for the season and co-leader across the league with Lance Franklin. The Suns have kicked 8.2 (50) launched from 40 defensive half intercepts. Scores are level for the eighth time in the match as Cameron steers through the first from a mark inside 50. The Giants have taken 12 such marks while the Suns have taken nine marks inside 50. Stephen May has launched his third goal from another defensive half intercept, his 11th possession gain in total. The Suns have kicked six of their 12 goals from possession chains launched from defensive half intercepts. Suns InterchangeAlex Sexton and is possibly out for the game. Rory Lobb has converted after a contested mark inside 50. The Greater Western Sydney ruckman has now taken 47 contested marks for the season, more than every player except Gold Coast's Tom Lynch with 55. Greater Western Sydney has had the better field position this quarter, with the ball inside its forward half for 78.9 per cent of its duration. This season the Giants average a time in forward half differential of 2:37 more than its opposition per game. Stephen Coniglio has been the most prolific player this quarter, already recording seven disposals. Across the match he has registered a gamehigh 24 disposals, however only he has only had eight kicks with just three effective. Giants InterchangeJeremy Cameron off due to an injury. Greater Western Sydney has made a bright start to the third term, with 21 extra disposals and seven more tackles than Gold Coast. The Giants have created the first four forward 50 entries of the term. Although Greater Western Sydney has won nine extra clearances, its less efficient ball use has allowed Gold Coast to win five extra midfield intercepts. The Suns have launched 5.3 (33) from 20 midfield intercepts and lead by a goal at half time. The first half has been characterised by endto-end football. Both teams have been able to transition the ball from defensive 50 to forward 50 on 29 per cent of attempts, well above the league season average of 21 per cent. In the past ten minutes Greater Western Sydney's ball use by foot has fallen away, with a kicking efficiency of just 39 per cent. 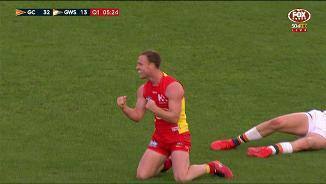 In the same period, 83 per cent of Gold Coast's kicks have been effective. In a relatively freeflowing game, the Suns have made it more difficult for the Giants to rebound this quarter. Gold Coast has won five forward half intercepts and have scored from four of them, for a return of 3.1 (19). Greater Western Sydney has taken its past two centre clearances inside 50 and have kicked a goal from both. The Giants outscore their opposition by 3.1 points from centre bounce clearances per game this season (ranked fifth). The Giants have improved their kicking efficiency to 84 per cent this term after it was measured at just 63 per cent in the first quarter. Greater Western Sydney has won six of the eight clearance this quarter and have now won nine more than Gold Coast (1910) for the match. Shane Mumford has given the Giants first use with 18 hit outs, including eight to advantage. The Suns have capitalised on the miss from Devon Smith, directly taking the ball endto-end to goal from the resulting kick-in. Gold Coast averages 5.2 points per game from kick-ins this season, the fourth highest average in the league. Gold Coast heads to the quarter time break in front for its fifth straight match at Metricon Stadium. Both teams took the ball inside 50 on 14 occasions, however the Suns had a kicking efficiency 12 percentage points better than the Giants. Greater Western Sydney has had the ball inside its forward half for 72 per cent of the past ten minutes. Since the Suns took a 19point lead, the Giants have won two clearances and an intercept inside forward 50, scoring from all three possession chains. Steven May has already won six intercepts (including four intercept marks) this quarter, a clubhigh since he did likewise in Round 3 2015. Two of the resulting disposals from these intercepts have directly led to goals to the Suns. Gold Coast is capitalising on its intercepts taken in its back half. The Suns have won nine defensive half intercepts and have taken five of them inside 50, scoring on each occasion for a return of 4.1 (25). Steve Johnson has successfully converted on the end of two consecutive possession chains launched from defensive 50 intercepts. The Giants score from 10.7 per cent of chains launched in defensive 50 this season (ranked fourth). Gold Coast has enjoyed a positive start at home, leading by two goals after ten minutes. This is impressive considering Greater Western Sydney is the best starting team this season, 90 points ahead of its opposition in the first ten minutes of games. Gold Coast has been able to dominate the possession via clean disposal. The Suns have recorded 23 kicks at 83 per cent efficiency, compared to the Giants who have registered 12 kicks but at just 50 per cent efficiency. Gold Coast have now converted its first two opportunities inside 50 to get the quick start. This season the Suns have been relatively potent once inside 50, kicking a goal from 25.8 per cent of entries (ranked sixth). 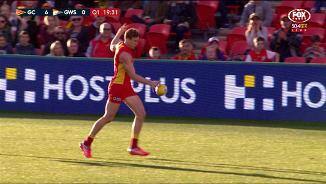 Tom Lynch has kicked the first goal of the game from the first forward 50 entry. 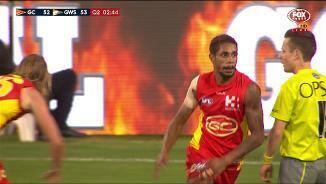 The Gold Coast fullforward has now kicked 58 goals for the season, placing him third of all players across the league. These teams have met on eight occasions with both enjoying victory four times each. Greater Western Sydney has won the last three encounters by an average of 57 points. 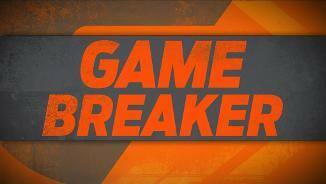 In Round 8 the Giants beat the Suns by 91 points at Spotless Stadium. In the past four weeks, the Suns have conceded an average of 15.8 forward 50 marks per game to their opposition (ranked 17th) while the Giants have conceded just 10.2 per game to the opposition (ranked fifth). 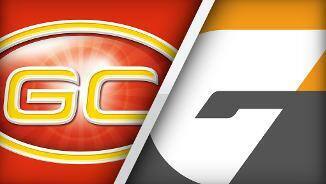 Welcome to Metricon Stadium for the Gold Coast Suns v GWS Giants Round 20 clash. GREATER Western Sydney has survived a mighty scare to hold off a brave Gold Coast and win by eight points in a thrilling contest at Metricon Stadium on Saturday night. Trailing by four points with five minutes remaining, the Giants relied on quick goals from Jeremy Cameron and Toby Greene to sneak home, 14.8 (92) to 13.6 (84). The win keeps them in third place with three rounds remaining. The Giants won, but the Suns were heroic in defeat. Already undermanned with their seven best midfielders on the sidelines, Gold Coast had Alex Sexton (corked thigh) and Tom Nicholls (knee) barely able to run for most of the night but battling on regardless. Nicholls was particularly courageous, sustaining a PCL injury but continuing to wage ruck war with Shane Mumford for four quarters. Gold Coast led by six points at every change – and the scores were tied on seven occasions - but the Giants' running power late in the match was just enough. Coach Leon Cameron is happy to take the four premiership points back to Sydney, but says his team had to work the entire way. "From where we've come from, any win is fantastic," Cameron said. "The competition's hard. We've been on the road for four weeks in a row, so that's a big task for us. 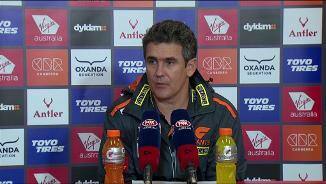 "There's no doubt that some of our boys, their energy levels are a little off. "But in saying that, the brand that the Suns played today was really good. "Credit to our boys, (they) found a way. We need to find a way when wins don't always work out perfectly for you." Stephen Coniglio (33 disposals) and Tom Scully (28) were all class for the victors, while Cameron's four goals were crucial. Steve Johnson was a cool head in a tight match with his 17 disposals, two goals and two assists, while Toby Greene's contribution (22, two goals and three assists) cannot be overvalued. For the Suns, stand-in skipper Steve May was a colossus in defence, finishing with 27 touches and 14 marks – many of them intercepts. Tom Lynch kicked four goals to join Lance Franklin on top of the Coleman Medal table with 61, while Jarrod Harbrow (24) and Jack Martin (22) were also key contributors. Gold Coast hardly had a poor player. 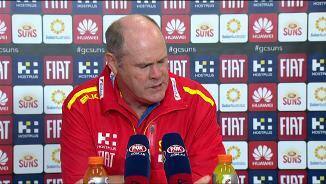 Coach Rodney Eade said he was disappointed for his players, but was proud of their efforts. "To be able to do that against nearly a full-strength team, who are second on the ladder, probably the best running team in the competition, it was just a game of courage and grit," Eade said. "Our contest, our ability to work for each other, I thought the spirit shown from the group, I must admit I thought it was amazing. "I thought they were terrific." It was a fantastic contest, free-flowing for most of the night, and both teams were frantic. 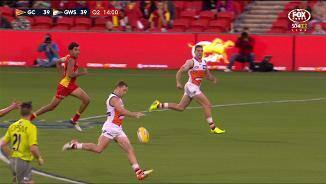 The Giants knew they were in for a battle from the opening 30 seconds when Lynch kicked his first goal. The Suns had three goals on the board inside the opening five minutes as GWS looked half asleep. Once they joined the contest, the teams put on some of the best footy seen at Metricon Stadium this season. The ball went from one end to the other as the teams traded goals. Gold Coast: Sexton had a rough start to his night, feeling some tightness in his hamstring and then collected a big cork to his thigh. He got the injury strapped up and played at full-forward, but was barely able to move before being taken off once and for all at three-quarter time. He is expected to be fine for next week though. Nicholls is a little worse off, doing his PCL early but battling on regardless. He had it iced after the game and is in doubt for next week. 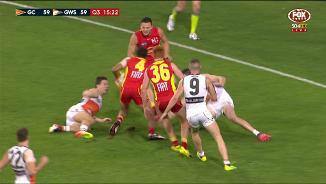 Greater Western Sydney: The only minor concern for the Giants came with Cameron, who appeared to hurt his hip in the third quarter. The star forward came back on though to kick the go-ahead goal late in the match and coach Leon Cameron said he was fine. After a month on the road, GWS returns home to Spotless Stadium next Saturday to take on West Coast. The Giants will be chasing another win to continue their pursuit of a top four finish. 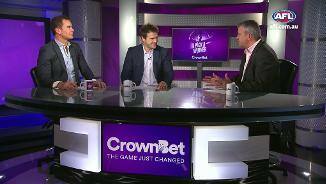 Gold Coast heads south for the first of back-to-back games in Melbourne when it plays Essendon at Etihad Stadium on Sunday.